This week’s feature is from Valeska, a mama blogger at Sincerely Vee Blog. 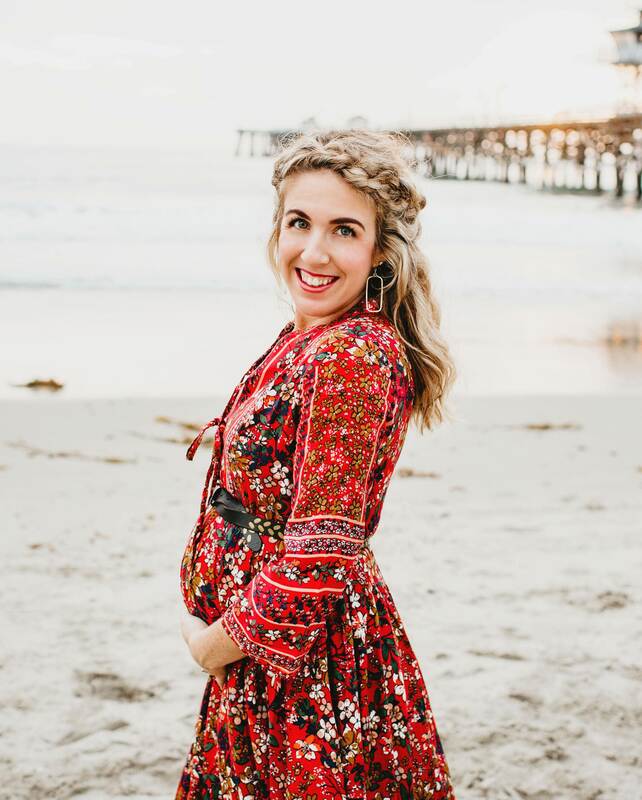 On her blog, she shares inspiration, encouragement, and truth to mamas seeking to widen their community of support, deepen their faith, and find hope + strength throughout motherhood. Today, she is sharing her story on how she became a new person, inside and out, after she became a mama – despite her hard upbringing. Thank you Valeska for being a part of our Real-Girls: Mothers community! Finding magic in the midst of motherhood + marriage is something we are all doing, together. Read below for Valeska’s post on experiencing the healing love of Christ through motherhood, and how it shaped her perspective on being a mama. “I grew up in a difficult and toxic home environment. My father was abusive, I felt responsible to protect my younger brothers, and my mother became dependent on me for emotional support. As a young child, I struggled to carry the weight of being the cornerstone for my family. I was never taught how to find myself, or how to develop my identity. I never dreamed or hoped for anything, because my parents didn’t shape me to have hope for the future. Because of this upbringing, I experienced emotional and mental trauma that took years for me to recover from. Fast forward a few years and I found myself in college feeling like I had no sense of who I was or wanted to be. I struggled to choose a career path and life direction for myself, and was carrying an emptiness that nothing could truly “fix” (even after years of therapy). All I knew is that I wanted to feel loved – to know that someone valued me, saw potential in me, and made me realize my worth. During this time, I also didn’t know Jesus. I thought there was probably a God, but I didn’t know then that He was real and wanted to have a relationship with me. One night I found myself at my wit’s end and decided I needed some real help. My therapist was away on vacation, so I called my local Christian church where I was able to speak with a wonderful woman who advised me to pray and ask the Lord to come into my life – so I did. That night He met me in my brokenness and completely transformed my life – I’ve never been the same since. The first year after I started going to church, I felt so loved and realized I am wonderfully created to do beautiful things. I began to learn more about myself, and finally discovered who I was in Christ. It was not an easy transformation, and I still haven’t even scratched the surface of diving deeper into my identity in Jesus. Healing from a life of trauma takes time, prayer, self acceptance and the desire to move forward. I have had to face some seriously dark places that were hidden in my heart. I have had to overcome depression, anxiety, fear. But the weight of those burdens was all lifted when I came to know Christ! The last obstacle that I am working on giving completely to the Lord is motherhood. My biggest fear in being a mom to my two kids is that I won’t tell them enough that they are truly loved and so valued. I want them to know that they have a creator who loves them and wants a relationship with them. My kids have allowed me to bravely face giants and fears I didn’t even know I had still buried! And because of my own upbringing, every day I live in constant awareness to pour affirmations into them and make sure they know how much beauty they have in them. There are moments where I doubt myself as a mother, because I didn’t have the example given to me of how a mother should be to her child. But since I became a Christian, and since I’ve worked so hard to heal my past, I know that I am not my mother. My kids have the fresh start that I never did: to have parents that help them embrace their own identities, to grow up in a loving and positive household, and to experience the love and grace that comes from the Lord. How I wish I had someone to tell me these things when I was young! But I’ve come to realize that everyone walks a different path for a reason. For me, I have the amazing opportunity to share my testimony to other mamas who may have also experienced an un-nurtured childhood. The journey to motherhood can bring anxiety and fear into those whose childhoods were like mine. It can be crippling, fearing whether or not your children will experience a better childhood than you did. 1. When my son was just a few days old I remember looking at his little face and thinking to myself: “stop worrying about tomorrow instead enjoy this moment. Be present.” That thought shook my heart and I have lived that way since. I can honestly say I have been present for all the little things. Why worry about tomorrow when we can’t change anything about it? The Word says that if we give our children the best we can, how much more will our Father in heaven give us! (Matthew 6:34). In my time as a mother I have tried to take those words close to heart, knowing if I have my children’s best interest at heart, God must have the most amazing plans for them. 2. If you grew up in a tough situation, just know you are a new creation in Christ. And if you don’t know Him I encourage you to get to know Him! I don’t know where my life would be without Jesus in it. Because of Him I know I am worthy, I am loved, I am a new creation. The things of the past are no more and I am making my own story through the love of Jesus. And I remind myself of this every day! 3. My knowledge of knowing how loved I am makes me happy to know my children will forever be protected by the love of God, because the love I was first given by Christ is now being given to my children. I am a new creation in that I have a guide who gives me little nudges in my heart when I am being unreasonable or too harsh on my children. I know God will guide me the right way so I can guide my children the right way.